What does Smasher have to say about the distinctive culture of Silicon Valley? Are you surprised by how the physicist Isobel Marter was treated by her male colleagues or was that kind of behavior to be expected in the 1960s? Are Ian’s priorities confused? Why does he pay any attention at all to the attempted takeover of his company and to the injustice done to his great aunt while Rowena lies in a coma? What’s the difference in how Ian and his mother-in-law handle Rowena lying near death? Which approach is more effective? One critic said Smasher is the story of Ian having a slow-motion breakdown as he grows more and more desperate. Do you agree? What kind of hero is Ian? Could he handle things better? What mistakes does he make? How much of the story in Smasher belongs to Rowena? How does Ian change as a person from the beginning of Smasher to the end? 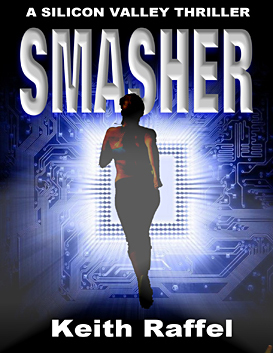 Four strands are twisted together in Smasher: the attempted takeover of Ian’s company, the mystery of who ran down Rowena, Rowena’s prosecution of an accused murderer, and Isobel Marter’s being cheated out of credit for a scientific breakthrough. How does one strand affect another? Which of the stories is most compelling? On page 163, Ian thinks, “If there was a chance, no matter how minute, that justice for Aunt Isobel would help bring Rowena back to me, I had to do something….” Did his pursuit of justice for his great-aunt end up helping Rowena? How ethical is it for Ian to break into Carlos Edwards’ apartment? How about when he confronts him at the airport?Did the situation excuse Ian’s violations of the law or should he have been arrested? How much further would he have been justified in going? What kind of relationship do Ian and Rowena have? How true-to-life is it? Were you satisfied with the ending? What will life be like for Ian after the events in the book?